Alfonso Morales Jimenez, is a Mayan indigenous person from the Colotenango community Guatemala. 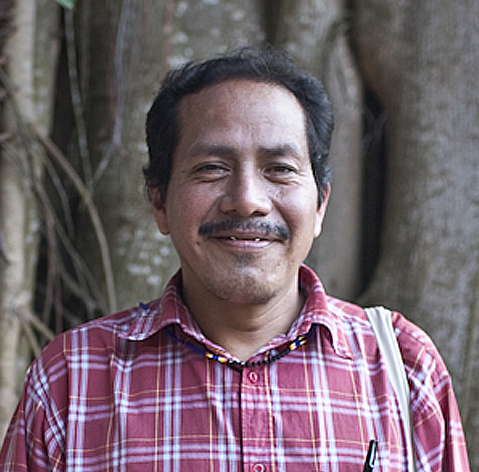 Alfonso spoke with passion about the inseparable link between forest, biodiversity and indigenous peoples. He opened by saying that for the Mayan people, everything has life: water, land, air, the sun, the moon, animals, forests etcetera. In the Mayan cosmo-vision all these elements are one and cannot be seen separately. They are linked with each other and should be treated with respect because disrupting and hurting one link, will affect the whole life-system. For the Mayan people, they have sacred places in mountains and hills where they practice their spirituality. He stressed that it is important for people to respect the Mayan culture and their traditional practices which were handed down from generation to generation. The Mayan people are in the process of saving and regaining some of their lost ancestral practices. Alfonso blames the disrespectful entry of the “foreigners”, invasion of other cultures and of the massive encroachment of neo-liberalism in their lands and resources. Alfonso explained that the current threats faced by the Mayan people include displacement, mining and oil extraction, building of hydroelectric dams, oil palm plantations, loss of native seeds and the privatization of forests. The communities defend their rights by implementing their own Mayan legal system. The Mayan legal system is their traditional way of managing their people, it is more organized and unites different linguistic Mayan people. Through the Mayan legal system, the Mayan people fiercely defend their territories and their existence by having signed agreements from their communities not to sell their land especially not to give way to mining and hydroelectric activities. The Mayan people defend the forests where life is derived from. The forest is an integral element which bonds the natural elements of our whole ecology and our life. The universe of which we are part of and in which exchange and develop in harmony with nature without harming it and its full life. Right now they are faced with a big threat and encroachment in forest lands by mining companies and hydroelectric projects which they fear will destroy the forest and the rich biodiversity in it. The mining industry is after the rich resources (uranium) and are exploring oil in their areas. These mining and oil activities would mean the cutting down of a substantial amount of trees in order to explore these resources. In the past years, the indigenous peoples in the whole of Guatemala held consultation processes and fought against these mining companies (no a la mina!). In 2008, the indigenous peoples all over Guatemala said NO to the draft mining bill and called for its withdrawal. The Mayan people believe that we are all custodians of the forests and the rich biodiversity if offers. The global problems we face right now, like climate change, are due to the misuse and abuse of our resources. As custodians of the forests it is, therefore, our responsibility to sustainably manage these resources. In order to keep the forest alive, the Mayan community plants 1,000 trees a year. They have a “comité de vigilancia de bosques”, or roughly a forest monitoring committee, composed of representatives of communities and community mayors. The comité de vigilancia de bosques ensures the proper use and management of the forest and the resources within. Permission has to be sought from the committee before any tree can be cut. They also have a municipal process where they want to achieve an agreement not to sell land and forests for mining and hydroelectric activities. The forest bonds the Mayan people, and that of the universe’s; physical, social, natural, cultural, political and economic life. It is where the Mayan people do their activities, where they live and have their collective social construction, where they carry their rights, aspirations and the place from which they come and to which they will return. For the Mayan people, there is no owner but caretakers for the benefit of a all life forms (human life, wildlife, plants, animals).